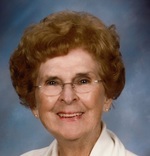 Beloved wife, mother, and grandmother Edna May “Midge” Sauer, age 94, died Tuesday, May 8, 2018, at her home in Suntree. Midge was born in Brooklyn, New York, in November 1923. After marrying USAF officer Kenneth Sauer in 1949, she embraced her new life as an Air Force spouse, living in half a dozen states as well as Great Britain. She came to Brevard County in 1968 when her husband was transferred to Patrick Air Force Base. Midge was a member of the Officers Wives Club, Retired Officers Wives Club, and a long-term member of the Catholic Women of the Chapel at Patrick AFB, where she held various positions. Midge volunteered for the Red Cross, Bloodmobile, and Family Services. She also served as a Eucharistic Minister to the sick at the Patrick Chapel. After she moved to Melbourne in 1992, she became a member of Ascension Catholic Church. Midge was a devoted wife, mother, and grandmother. Nothing made her happier than spending time with her children and grandchildren. She was preceded in death by her son Michael and husband of 66 years, Kenneth. Survivors include son Steve (wife Gail) of Peachtree City, GA; daughter Laurel (husband Davis) deMontluzin of Palm Beach Gardens, FL; daughter Janice (husband Bruce) of Fayetteville, GA; and grandchildren Kerri and Kevin Sauer, Jillian and Brooks deMontluzin, and Ben and Jesse Baker. The family will honor her memory at a memorial Mass on Monday, June 4, at 11 a.m. at Ascension Catholic Church in Melbourne. The family will receive guests before the service from 10 to 11 a.m. in the Ladies Chapel. Midge will be interred at Cape Canaveral National Cemetery alongside her beloved Kenneth. In lieu of flowers, the family requests that donations be sent to St. Jude Children’s Research Hospital in Memphis, Tennessee. To send flowers to the family of Midge Sauer, please visit our Heartfelt Sympathies Store.